This gravy can turn about a hundred plain breakfasts into County-Style Super Breakfasts. 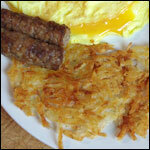 Drizzle some gravy over scrambled eggs and top with a pinch of Cheddar cheese for County-Style Scrambled Eggs. 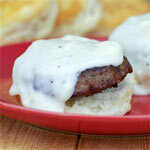 Put eggs and a sausage patty on toast or a biscuit and then drizzle with gravy for an easy Country-Style Eggs Benedict. Be sure to keep any leftovers. 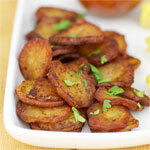 It also goes great with just about any meat you might serve for lunch or dinner. In a small sauce pan over medium heat, melt the butter. Add the flour and stir until smooth. Slowly, mix in the milk. Season with salt and pepper. Bring this mixture to boil. Reduce heat to low and cook for 3 or 4 minutes - stirring often - until thickened. The dish above is a Country Benedict I made using this gravy. 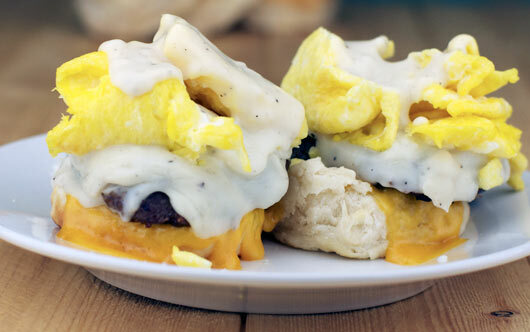 It's a biscuit topped with Cheddar cheese, sausage, scrambled eggs and gravy. Kinda crazy looking, I know. But wow... was it delicious! A simple peppery, creamy gravy that goes great with eggs, biscuits, sausage, ham and a bunch of other breakfast favorites. 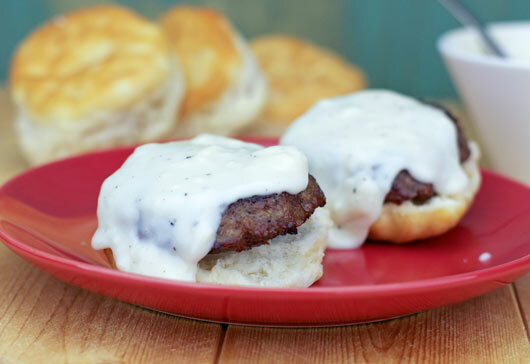 What do you think of Country-Style Pepper Gravy (For Biscuits)? Was easy and very delicious. Perfect, came out exactly how I hoped. 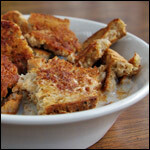 Do you have a recipe for southern style tomato breakfast gravy? So easy and delicious... I love biscuits and gravy. YUMMY! So glad I found this simple, delicious recipe that even I couldn't screw up. I've never been able to make gravy successfully before. I did add bacon grease though and it's an awesome recipe for chicken fried Patty's and country fried steak. Yummy! I use rice flour because of health and it still tasted yummy! I just cut up some sausage and put it in the mix and loved it. Pretty east and tasty. 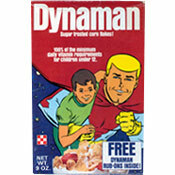 But I prefer the kind with sausage crumbles in the actual gravy. When I was in Kentucky and Florida, they made the gravy with pan drippings from sausage or bacon. Exactly what I was looking for and it was very easy for my first time making gravy! Well, that was easy! Simple and tasty over biscuits and bacon. I might go to KFC later to get some chicken so I have something to put the leftovers on. Not a good diet day for me, but I liked your recipe.